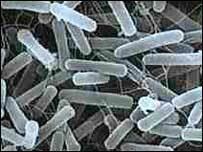 Cheap, portable batteries based on sugar-eating bacteria could be a possibility, say scientists. A novel microbe, found in marine sediments, is able to convert sugar into electricity with a higher efficiency than any previously known organism. Because sugar is abundant in the environment, a battery using the new microbes could provide economical electricity in remote places. While the prospects are good, the researchers say more work needs to be done before their research can be exploited commercially. Previous study has shown it is possible to use microbes to convert organic matter into electricity. But the process has been cumbersome and costly. Now, writing in the Journal Nature Biotechnology, researchers from the University of Massachusetts-Amherst in the US report how the bacterium Rhodoferax ferrireducens can turn simple sugars - found in fruit - into electricity. "There's been a lot of interest in microbial fuel cells trying to covert sugar into electricity," Derek Lovley of the university says. "But in the past, they've converted 10% or less of the available electrons, and now we're up over 80%." R. ferrireducens was found in marine sediments in Virginia. "This is a unique organism," Mr Lovley says. It is capable of generating electricity while feeding on simple sugars such as glucose (the main form of sugar in the environment), fructose (found in fruits), sucrose (in sugar cane and beet) and xylose (a constituent of wood and straw). "Although the new process is highly efficient, it is slow. And as the process is right now, we're not talking about a lot of power. It's barely enough to run a calculator." Nonetheless, the prototype device ran for up to 25 days. In principle, it could allow a cup of sugar to power a 60-watt light bulb for 17 hours. A bacterial battery could be used in environments where it is difficult or costly to charge batteries. The US Department of Defense is interested for powering underwater microphones and sonar. For people living in poor, remote communities, it might be possible to adapt the process so that they can use farm waste to power batteries.